From the Hugo Boss timepiece collection, this sleek watch for her is crafted with an IP plated case, stone set indices, softly complemented by a black dial. For the modern woman in search of sophisticated chic with an understated feel, this is the perfect accessory. 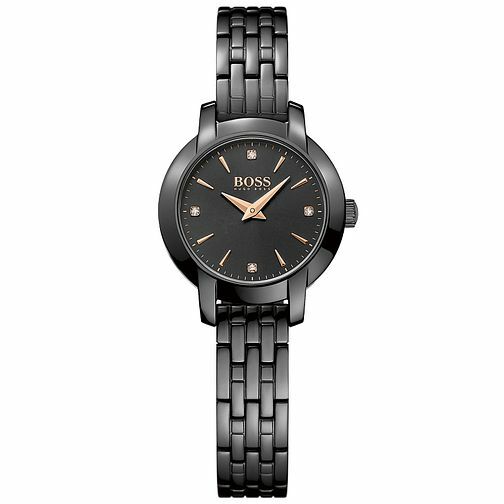 Hugo Boss Ladies' IP Plated Bracelet Watch is rated 4.7 out of 5 by 3. Rated 4 out of 5 by Anonymous from Elegant The slimline elegancy of this time peice is a measure of quality and style encapsulated by its sheet simplicity.